Of all the books which make up the Bible, the Psalms are arguably among the most popular verses used in the practice of magic. These verses are often prayed, in whole or in part, during the course of performing a spell. Typically, verses are chosen according to tradition or according to a personal interpretation of the text. However, what many folks don't know is that the Psalms were originally intended to be sung. 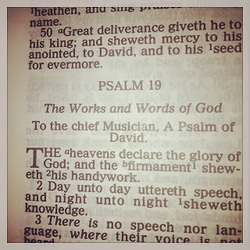 If you look at your bible closely you'll notice that many of the Psalms (about 55 chapters) begin with the words "to the chief musician". What this means is that the Psalms are intended to be performed under his direction in a manner similar to a choir director. If you recall, Christianity is an offshoot of Judaism and many of the books of the Bible was written by Hebrews or followers of Judaism. In Jewish Synagogues, prayers are often led by a person known as a Cantor. Cantors are often trained in the Musical Arts and it is their responsibility to teach students to read from the Torah and to teach the congregation how to participate in prayer services. Make a joyful noise until the Lord, all ye lands. Of course we can't all sing as beautifully as the Cantor, but with a little practice we can sing the Psalms in our own way. However, our songs are not limited to the Psalms or even to bible verses. Often when I am sewing a doll-baby, a mojo bag, or burning candles I find myself humming or singing a hymn. One of my favorites is "Victory is Mine" as it can be adapted to any purpose. For example, let's say that I am making a mojo for the purpose of attracting love into my life. I have already fixed the mojo, smoked it in incense and fed it oil. Next, I may hold in it my hands and focus on my goal and sing the following verses. "Love is mine. Love is mine. I told [loneliness] get thee behind. Love today is mine! " The next time around I might substitute the word "depression" for loneliness. The next time around I might substitute another word that is symbolic of what may prevent me from finding love. As you can see, you can easily substitute the world "love" for whatever you goal might be. If you find that you have trouble putting into words that which you wish to "get behind" you can simply keep "Satan" in the lyrics as indicative of any opposing force which you feel you must overcome in order to obtain your goal. Another favorite of mine, "This Little Light of Mine," as you can imagine it is often song when I am burning candles for myself or others. Before I began my spiritual journey that lead me to Wicca and then back "home" to the Southern Folk Magic Practices prevalent in the region in which I was born, I grew up in the Baptist Church. I knew many folks who were known as "Prayer Warriors", that is, they were gifted with the power of prayer. The truth is, the power to pray and pray effectively is both a talent and a skill. When I transitioned from chanting incantations to praying, I found that the talent I had as a writer did not translate to being an orator. I often found myself rambling. At other times I would make my prayer or petition and then think, "now what?" I often felt like my prayers were lacking, that there was more I could be doing, should be doing to put more feeling and emotion into my prayers. Then one day I was watching a television show and during one of the more dramatic moments they played a song over a montage of a wedding video. Suddenly I felt something inside me shift, I was so moved by the beauty of the song and the expression of love in the video that I broke down crying and I couldn't stop for probably 20 minutes. I felt that that song didn't just come out of his body but from a place deep within his soul and when he sung the emotion and feeling was raw, emotional and beautiful. It inspired me to bare my soul to my God and my spirits through song. I found that I can make my prayer in my own words and then sing my song without thinking about it or worrying about what I wanted to say but rather just conveyed my wants, needs, and desires through the emotions stirred up by the song. For this reason, my workings and rituals are often accompanied by music. Prayer need not be a series of words uttered in faith, silently under your breath but rather a song in your heart that you have set free. By incorporating music and song in your workings and rituals you can free mind from the doubt that you are getting your message across to the spirits with whom you work and increase your ability to move closer to God and improve your chances of success in your endeavors.